The economy seems like it’s been in choppy waters lately. A rise in manufacturing is negated by a weak jobs number. The US housing market’s signs of life are impeded by high gas prices. The euro zone appears to be improving, then a sovereign debt rogue wave surfaces in Spain. How can investors make sense of these mixed signals? 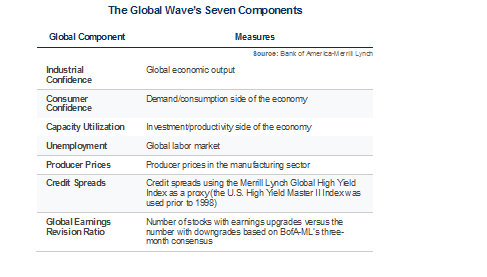 Analysts at Bank of America-Merrill Lynch created the Global Wave, a compilation of seven global indicators designed to provide a comprehensive assessment of trends in global economic activity. The compiled data allows investors to predict equity market performance and equity rotation. Last week, the Global Wave was signaling a trough in the global cycle, which prompted BofA-ML to suggest “investors position for an economic upturn” by increasing their exposure to equities. According to BofA-ML’s research, the MSCI ACWI (All Country World Index) averages a 14.2% increase for the 12 months following a trough in the Global Wave. Historically, the index has experienced a positive return 86% of the time. What turned the tide? BofA-ML says global central bankers’ easing measures “appear to be having a positive impact” and macroeconomic data is improving. Collectively, global central bankers have implemented 138 stimulative policy initiatives in just the past eight months, according to ISI Group. The latest of these include the International Monetary Fund (IMF) doubling its eurocrisis fund to $430 billion, China easing monetary policy, and interest rate cuts in both Brazil and India. Earnings season is off to a great start in the US. Of 106 initial companies in the S&P 500 Index reporting, 83% beat analyst estimates, according to a FactSet blog entry I found through Business Insider. If the current pace holds up, it would represent the highest beat-rate in three years. Add this positive news about US stocks to the data from BofA-ML above, which indicates emerging markets and the Asia Pacific ex-Japan region have historically been the best-performing regions following a trough for the Global Wave, and you have a real opportunity. In terms of which sectors have historically been the best performers, the data shows technology, diversified financials, basic materials, autos and energy have outperformed. That’s good news for oil and gold stock investors. The Global Wave may be just what is needed to wash away the performance gap I highlighted in my previous post. Frank Holmes will present a Welcome Keynote speech on Monday, May 14, during the New York Hard Assets Investment Conference. The S&P 500 Stock Index is a widely recognized capitalization-weighted index of 500 common stock prices in U.S. companies. The MSCI ACWI (All Country World Index) Index is a free float-adjusted market capitalization index that is designed to measure equity market performance in the global developed and emerging markets. The BofA Merrill Lynch Global High Yield Index tracks the performance of high yielding investment grade bonds of corporate issuers in countries around the world. The BofA Merrill Lynch U.S. High Yield Master II Index tracks the performance of U.S. dollar denominated below investment grade rated corporate debt publically issued in the US domestic market. To qualify for inclusion in the index, securities must have a below investment grade rating (based on an average of Moody's, S&P, and Fitch) and an investment grade rated country of risk (based on an average of Moody's, S&P, and Fitch foreign currency long term sovereign debt ratings). Gold Stocks: Where Is The Bottom?